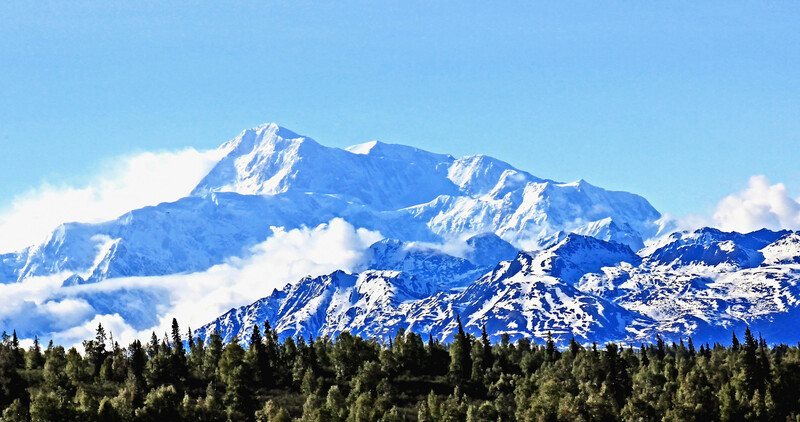 Denali -Mc Kinley is a 20,230-foot high mountain. This photo was taken from 25 miles away. This is one majestic mountain. it is impressive from any vantage point. A lot of snow and clouds lower than the peek. Only seen by about 30% of people who visit Denali National Park. It tends to be cloud covered much of the time. I was fortunate to arrive at 6 pm with the mountain in full sunshine with some lower clouds--a perfect photo opportunity. I went directly to shoot from behind the main lodge and checked in later. Two days later I got the courage to fly on a charter with 5 others to and around the summit. It was an amazing experience. To prove that I did it, I was photographing from the co-pilots seat.